Milk thistle has been used for centuries for both its flavoring potential and its medicinal benefits. Learn everything about this unique herb. Milk thistle, a flowering plant originally from the Mediterranean, has been used as a medicinal herb for nearly 2,000 years. Today, its seeds are regarded as a commodity, and its production contributes to the global agronomic sector. Protecting the liver. The silymarin in milk thistle which has been found to help protect the liver. Managing hepatitis B and C. Hepatitis is the swelling of the liver and can be caused by a range of factors. Research shows milk thistle improves survival rates in people with chronic hepatitis. Relieving jaundice. Jaundice causes the skin and whites of the eyes to turn yellow, and is often a symptom of cirrhosis or other liver problems. Lowering inflammation. Milk thistle also contains antioxidant compounds that have an anti-inflammatory action. Milk thistle contains a flavonoid called silymarin, which is made up of four smaller compounds: silybin, isosilybin, silydianin, and silychristin. These phytonutrients - the most active one being silybin - have been found to protect the liver from damage. The most widely-studied medicinal use of milk thistle is, undoubtedly, as a liver-protecting herb. It is theorized that silymarin, the active compound in milk thistle, prevents toxins from binding to liver cells, preventing them from accumulating. It may also help the liver produce more cells and repair itself, though neither of these mechanisms has been fully ascertained. SILYMARIN, THE ACTIVE COMPOUND IN MILK THISTLE, PREVENTS TOXINS FROM BINDING TO LIVER CELLS AND ALSO EXHIBIT ANTIOXIDANT PROPERTIES. Herbs with hepatoprotective properties are chicory and dandelion, whereas blueberry and tea plant are rich in antioxidants. Milk thistle is likely safe for most people when taken medicinally. Potential side effects for taking milk thistle include allergic reaction, bloating, blood clots, constipation, diarrhea, fever, gas, headache, and nausea. Women who have endometrial cancers, uterine fibroids, or endometriosis should use caution when taking milk thistle because parts of the plant can provoke negative hormonal reactions. Those who are allergic to daisies, artichokes, or any other plant in the Asteraceae family should not take milk thistle because it can trigger an allergic reaction. Milk thistle lowers blood sugar levels, so those who suffer from diabetes should exercise caution when consuming this herb. Women who are pregnant or breastfeeding should consult a physician before taking milk thistle. Milk thistle has been used for centuries in medicinal forms. Nowadays it is more common to find it in capsules and extracts; however, milk thistle fresh or dried seeds can be used to make herbal preparations at home. Milk thistle also has minor culinary uses. The fresh leaves, stems, roots, and flower buds can be consumed after being boiled, like artichokes. Infusion. A hot tisane of milk thistle fresh or dried seeds can be made at home or bought in the convenient form of tea bags. Liquid extract. Few drops of this concentrated preparation can be added to a glass of water in order to reap the hepatoprotective properties of the herb. Capsules. This is the most widely available supplemental form of the herb. Milk thistle capsules contain fixed doses of silymarin. 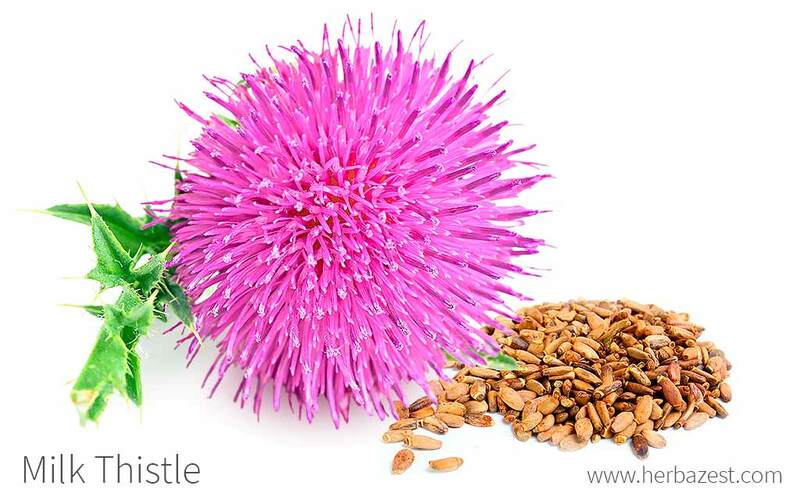 Raw, fresh milk thistle is easy to find in most health food stores or online. However, the most common presentations of milk thistle include prepared tea bags, which are also commonly available in some larger supermarkets, whereas online retailers and specialty stores provide a wider variety of tea bag manufacturers, or offer ground milk thistle in combination with other similar herbs, as well as the seeds of the plant. Milk thistle supplements are mainly found in specialized health stores and online retailers. It is worth to notice that each brand may come with different concentrations of milk thistle active compounds. THERE IS A WIDE VARIETY OF MILK THISTLE SUPPLEMENT CHOICES AVAILABLE THROUGH ONLINE RETAILERS. Milk thistle is capable of adapting to various types of soil and climates, but it does grow best in fertile, overgrazed pastureland. Milk thistle prefers full light exposure, but can grow well under light shade. Milk thistle should be grown in loamy or sandy soil. It is suggested that milk thistle seeds be sown about 0.1 inches (3 mm) deep at the beginning of spring. Regular pruning is not required, but flower stems may be removed to keep foliage effect. Propagation should be done in the late spring or early summer. More detailed information about growing milk thistle can be found in the herb garden section. Also known as Mary's blessed thistle and silybum, milk thistle is native to the Mediterranean regions, but grows in many different parts of the world. The stems are thick but hollow or filled with a pith and branched from the base. They have shiny sparse hairs on the upper surface and are dull and more hairy on the lower surface. The flower heads contain approximately 50-200 purple florets. The flowers are surrounded by large, stiff, reflexed bracts. Milk thistle is a member of the Asteraceae family, which contains over 23,000 species spread out over 1,620 genera and 12 subfamilies. This botanical group has a worldwide distribution and is economically important, especially in herbal medicine. Other well-known Asteraceae members include dandelion (Taraxacum officinale), lettuce (Lactuca sativa), and artichoke (Cynara cardunculus). Over the course of history, genetic differences have emerged between the different populations of milk thistle, since it has adapted to be grown in different places throughout the world. Their main flavonoid content now differs depending on conditions such as rainfall and temperatures in the area where they are planted, as well as on the genetic differences that have occurred over time. The documented importance of milk thistle dates back to 100 CE, when it first appeared as an herbal remedy in ancient Roman medicinal treatises. After this, the Saxons used milk thistle to ward off snakes. During Medieval times, the leaves and stalks of the milk thistle became a common ingredient in salads, pies, and soups. By the 19th century, European physicians began recommending milk thistle as an effective way to treat liver problems, and research continues to be done into its healing properties to the present day. Germany is currently the largest producer of milk thistle; However, production of commercial milk thistle also exists on a large scale in Austria, Hungary, Poland, Argentina, and China. It has also been widely introduced to other places outside its natural habitat, including New Zealand, Australia, and North America. In ancient Greece, Dioscoriodes authored a book with approximately 600 different plants and herbs, including milk thistle, which was considered a cure for snakebites. Skin care. Some people believe that applying milk thistle to the skin can help towards clearing the face of acne. Gardening. The milk thistle plant is also used for ornamental purposes. Germplasm Resources Information, Taxon: Silybum marianum (L.) Gaertn.